Have you ever looked at your to-do list and had no idea where to even start? On top of your main projects, you have meetings to attend, an endless stream of emails to answer, and a schedule to juggle (and that’s not even accounting for your personal life!). With all those tasks competing for your attention, it can feel almost impossible to get anything done. And the longer your to-do list grows, the harder it gets to even start. Task paralysis and procrastination are familiar beasts. But how do you actually overcome them? The answer might just lie in the past. Dwight D. Eisenhower was the 34th president of the United States, a WWII general, and a master at time management. Winning a war and running the country are no small tasks. So Eisenhower developed a powerful way to prioritize his to-do list so he could focus on what was most important. 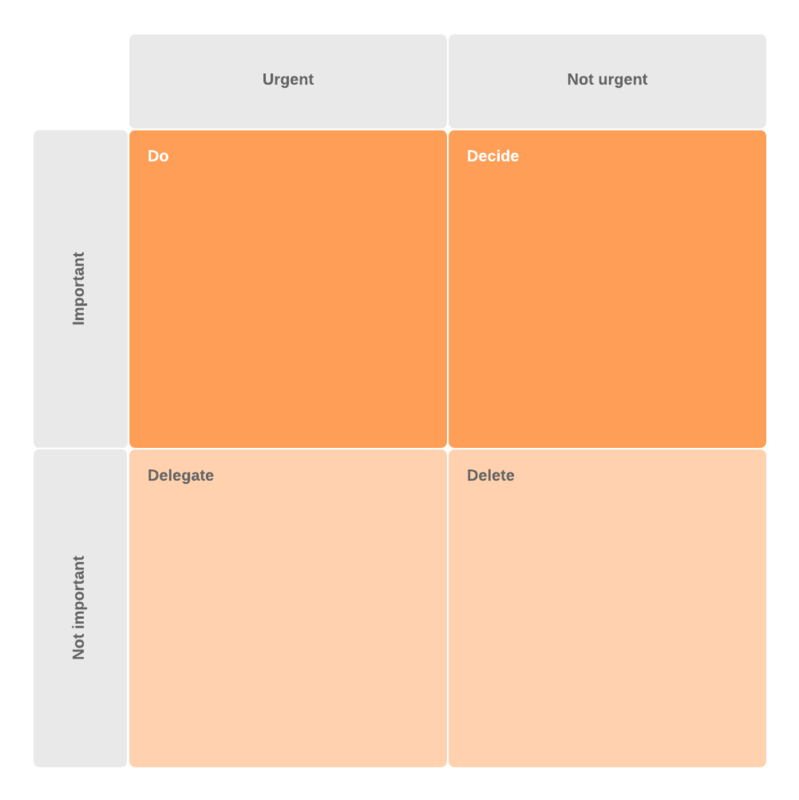 The Eisenhower Matrix (also known as the “urgent-important matrix”) is a simple decision-making tool that helps you prioritize your to-do list based on urgency and importance. The idea is to make a list of all the tasks you need to accomplish and sort them into the applicable quadrant. At the heart of the Eisenhower grid is understanding the difference between “urgent” and “important” tasks. Important: Important tasks align with your values and help you achieve your goals. They are often focused on the long term and may not have immediate results. This makes it easy to neglect them in the short term for more urgent activities. Urgent: Urgent tasks are time sensitive and demand immediate attention. Sometimes we put off important tasks long enough that they then become urgent—causing stress and anxiety as we rush to finish them on time. By distinguishing between what is urgent and what is actually important, you can start to work proactively. Each quadrant corresponds to a different level of priority. As you identify which tasks or activities are important, urgent, or a combination of the two, you can then decide how to handle them. The first quadrant is your “important and urgent” to-do list. These are tasks that have both high importance and urgency. Focus on accomplishing these tasks first. Pro tip: There are two types of tasks that end up in this first quadrant: tasks that you couldn’t foresee and tasks that you procrastinated. As you create your list, consider which tasks you left to the last minute and make a plan for how you can avoid procrastinating them in the future. One way to reduce future stress is to build in extra time in your schedule to account for unforeseen tasks and give you a buffer for any work that’s fallen behind. 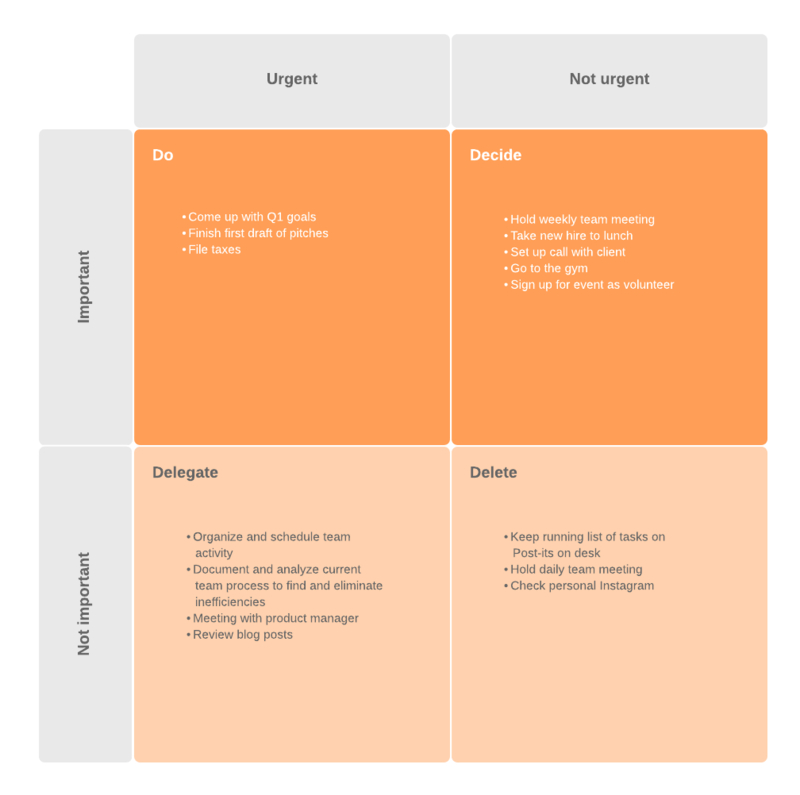 The second quadrant covers tasks that are important but not urgent. In other words, you need to do them someday, but there isn’t a strict or immediate deadline on them. These tasks help you achieve your goals and complete important work, but because they aren’t urgent, they are often neglected. Quadrant 3 is where many people get stuck. This is the “urgent but not important” list. Typically, these are tasks that prevent you from working toward your goals (or cause you to focus on achieving others’ goals). Tasks in this quadrant often come from other people. For example, your co-worker might ask you to review a report for them that is due in a few hours. Try to minimize what you work on from this list. Politely decline or delegate these tasks when possible. For everything else, consider setting aside a regular period in your schedule to address other people’s concerns. Quadrant 4 covers the lowest priority items. These are the “not important and not urgent” tasks. Ultimately, anything left on this list is just a distraction so the best way to handle these tasks is to eliminate them from your priorities altogether or push them back to finish at a later time (ideally when you don’t have more important items to do). The beauty of the Eisenhower decision matrix is that it is simple to use and apply. However, there are a few best practices you can use to get the most out of it. Optional: Fill in Quadrant 4 with gray (or another muted color) to identify which tasks to ignore. Too many tasks on your list can overwhelm you and make it difficult to finish your work on time. To prevent task paralysis and ensure you stay on schedule, limit each quadrant to no more than 10 items. A good rule of thumb is to focus on just 5 to 7 tasks in each category. Who says you can’t have two Eisenhower matrices? If your overall to-list is a mile long (or you like compartmentalizing your priorities), consider separating your personal and professional to-do lists. Make one matrix for your work and one for your personal life. Creating multiple visuals can help you analyze how you’re using your time and ensure nothing falls through the cracks. It’s easier to optimize your time if you have fewer things to juggle. As you create your to-do lists, focus on cutting out the fat. Look for tasks you can delegate or eliminate altogether. This step will make it easier to accomplish everything else on your list. Time management is never easy. But with the help of the Eisenhower Matrix, you can increase your productivity while focusing on the things that matter most. Lucidchart is a diagramming solution that lets you create custom charts with ease. Use their ready-made priority charts to make your next Eisenhower grid. Streamlined sharing options let you communicate your priorities to your team members at the click of a button.